The 75 mm Gun Motor Carriage M3 (M3 GMC) is a Rank I American tank destroyer with a battle rating of 1.7 (AB/RB/SB). It was introduced in Update 1.49 "Weapons of Victory". A M3 half-track with a 75 mm gun on its rear, the M3 GMC packs a punch against its rivals. Just about any enemy is deadly to the 75 mm GMC M3, as the armour will only stop light machine gun rounds. In particular, vehicles with autocannons or heavy machines guns are often the deadliest for the crew. Every tank cannon will penetrate the armour, and although most guns at its rank cannot do so, the vehicle can be hull-broken. Aircraft and artillery are also very dangerous. Ammo racks of the M3 GMC. The 75 mm GMC M3 cannot go toe-to-toe with other tanks due to the lack of protection for the crew and insufficient armour layout. The armour can only stop rifle-calibre rounds from machine guns, and could possibly deflect 12.7 mm rounds off the frontal arc, but this vehicle was never designed to fight other tanks head-to-head. Its play style may generally confuse new or inexperienced players, as they would bring the vehicle up close to the front. The vehicle was mainly purposed for destroying tanks at a distance, hence the amazing penetration values with the gun at its battle rating. It will still penetrate tanks of its BR and rank even at 500 meters, which means staying from afar is the best way to play this particular vehicle. However, relocating after successive shots is another good idea. It prevents returning fire from the enemy, especially artillery strikes. It is not wise to bring this vehicle upfront, as it will probably not survive long with rigorous combat. However, the M3 GMC can be quite deadly up close as well if it manages to take the enemy by surprise. If planning to go upfront, stock up on the M61 shot, which will increase the gun's lethality to tanks due to its internal HE charge. 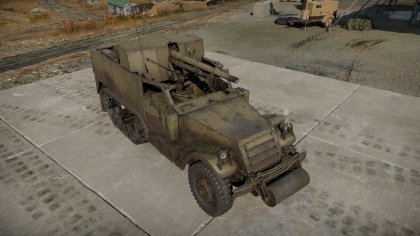 Keep in mind that this vehicle has to be supported by teammates, experienced players will take note of its long reload and may try to rush out and destroy the M3 GMC during the reloads. Effective use of its excellent reverse speed to take cover or back out of enemy fire will increase the chances of surviving. Overall, this vehicle is an effective tank destroyer for its rank, rivaling the ZiS-30. It combines the penetration ability of the ZiS-30 on to a larger caliber weapon, on the same time marrying the weapon on to the M3 halftrack, which is already blessed with exceptional mobility. The low fire rate can be a fatal downfall for many newer players; always stay in cover while reloading. Many players will stay out in the open while they wait for the gun to reload; this is a deadly mistake. Good cannon for its rank. Penetration offered by the M72 shot is excellent, but it lacks explosive fillers. The explosive abilities of the M61 shot is deadly if penetration occurs. Acceleration is best when compared to other tank destroyers of its rank. Relatively low target compared to other tank destroyers. New players may find the car-like turning of this vehicle very hard to use. Lightly armoured, will only withstand 7.92 mm rounds effectively. 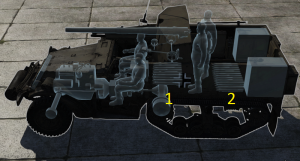 Any cannon round will penetrate this vehicle anywhere. Entire crew is exposed, can be incapacitated by aircraft simply ramming into the vehicle. Susceptible to nearby explosions, especially from artillery. Commander and loader are in-line with each other when view from the front, and same for the driver and gunner. Poor reload time, will be out-RPMed by every other cannon at this BR. Stock AP shell has poor after-armour effect. Slow traverse speed for the cannon. In the opening stages of World War II, the American military leaders realize they did not have any adequate anti-tank weaponry to repeal a German tank assault. An urgent request for one developed into something akin of an improvised weapon. Army development took a M3 half-track and placed the French 75 mm Gun M1897A4 gun onto it with a huge gun shield to protect the crew. This experimental vehicle was called the T12, and was deemed to work well enough to be adopted and standardized in October 1941 as the 75 mm GMC M3. From 1941 to 1943, about 2,200 units were produced, but many were converted back to standard half-tracks before they got issued, so it resulted in only about 842 units seeing combat service. The M3 GMC was not particularly a protected vehicle given that it used a half-track as its basis, giving it rather limited protection for the crew. The gun crew on the half-track has a huge gun shield to take cover behind as they ready the weapon, but the truck driver and passenger would have no protection available. The French 75 mm Gun M1897A4 attached was a multi-purpose artillery piece, it could fire an armour piercing shell that could penetrate 81 mm of armour at 500 yard in a direct-fire role, and could hit targets up to 9,200 yards in an indirect-fire role. The 75 mm gun could only traverse in a limited arc forward, unable to traverse to face the back. Nevertheless, for a rushed production, the vehicle was deemed acceptable for use. The vehicles saw service first in the Philippines when the Japanese invaded in December 1942, used to fend off Japanese vehicles and infantry. When the Japanese conquered the Philippines, they captured the 75 mm GMC M3s and used them against U.S. Forces when they invaded the Philippines in October 1944. The largest concentration of the 75 mm GMC M3 was in the North African Campaign, and then again in the Sicilian Campaign. During the Sicilian campaign, it was gradually phased out for the 3-inch Gun Motor Carriage M10 as it was starting to become obsolete, but it stayed as a support weapon as assault guns for special forces. In the Pacific, they saw further use in the Marine Corps blasting Japanese tanks and fortifications on the major island battles before being gradually replaced by the 105 mm artillery on the M7 Priest. The British, French, and Philippine Army were the few Allies who got their hands on the 75 mm GMC M3. In British terminology, it was known as the 75 mm SP, Autocar. 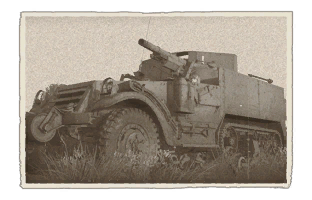 The Free French forces used some M3 GMC in the Western Front during the invasion of France. The Philippine forces used the M3 GMC when the U.S. supplied their military there with it. The Philippines retained the M3 GMC up to the 1960s, being used by a number of factions, from the Japanese when they captured it in the 1940s, the rebels of the Hukbalahap Rebellion, and in the Korean War by the Philippine Expeditionary Force. An excellent addition to the article will be video guides, as well as screenshots from the game and photos. Skins and camouflages for the M3 GMC from live.warthunder.com.